The National Hispanic Caucus of Hispanic State Legislators (NHCSL) was founded in 1989 as a nonpartisan, nonprofit 501(c)3. The mission of the National Hispanic Caucus of State Legislators (NHCSL) is to be the foremost organization serving and representing the interests of Hispanic state legislators from all states, commonwealths and territories of the United States and the Western Hemisphere. 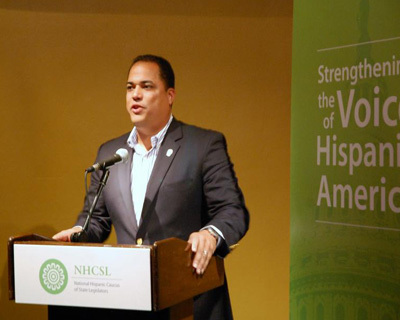 The NHCSL meets its mission by serving as a catalyst for joint action on issues of common concern, such as housing, immigration, education and healthcare, to all segments of the Hispanic community. In addition, NHCSL provides a forum for information exchange and member networking; supports leadership training; acts as a liaison with sister U.S. Hispanic organizations; promotes public and private partnerships with business and labor; and partners with Hispanic state or provincial legislators and their associations represented throughout the world. The Summit convenes state legislators, Hispanic organizations, corporate representatives, community and business leaders to discuss issues that concern the Hispanic/Latino population. The Summit agenda reflects the current state of the Hispanic/Latino community and delves into unique and innovative ways to improve the quality of life for the constituencies we serve. The Summit presenters and speakers are high-caliber experts in the areas of immigration, healthcare, economic development, education, energy, broadband and technology, among others. The Summit offers NHCSL partners the opportunity to gain maximum exposure and visibility before a unique national audience of state elected officials. A sponsorship with the National Hispanic Caucus of State Legislators aligns your cooperation with one the leading national Hispanic legislative caucus, connecting you with state legislators from around the country. National Summit: Sponsorship for the National Summit offers an opportunity to support and participate in two-day activities and sessions with NHCSL’s leadership, Business of Board of Advisors (BBA), local elected officials, community and business leaders and policy experts who share the mission of strengthening the voice of America. The Summit brings approximately 200+ attendees annually from across the U.S., Puerto Rico and U.S. Virgen Islands. Welcome Reception: A themed celebratory networking reception to kick-off the series of activities and policy sessions. Summit Sessions: These concurrent sessions examine serious policy areas affecting the Latino community at the state, National and International level. Keynote Luncheon: The Keynote Luncheon emphasizes in major issues, currently being reviewed at the National level. A conversation with a National leader or policy expert on evaluating and finding positive and realistic solutions to the issues impacting the community. Noche De Celebración: An evening to celebrate and honor the achievements and commitment of outstanding local community leaders that have helped advance the state and wellness of the Hispanic community in different areas such as education, arts & culture, and social justice.